Don Cowie silenced the Hibs support by scoring on his last visit to Easter Road. Eight years later, he is back and aiming to upset the natives again. The midfielder’s last goal for Inverness sparked a 2-1 win in Leith in November 2008, with a certain Ian Black netting the winner. Tonight’s Scottish Cup fifth round replay between Hibs and Hearts is rather more prestigious, and Cowie wants to inflict damage once more. He already knows the value of the Edinburgh derby having made his Hearts debut in the first match at Tynecastle. Watching the dejection in the home dressing room after a two-goal lead was squandered with ten minutes remaining left him in no doubt about the pride involved. An unexpected trip to Easter Road adds to an already-congested fixture list but Cowie is ready for action. His career has taken him to the dizzy heights of England’s Premier League and back since he last played there. He joined Hearts on transfer deadline day after leaving Wigan and will make only his third appearance for his new club this evening. Two of those will have come against Hibs. A seasoned professional at 32, he can’t get enough of the Capital rivalry. “I remember scoring in my last game there. I’d love to do that again tonight,” he told the Evening News. “I remember it was a left-footed shot from the edge of the box and we went on to win the game 2-1, so it was really pleasing. I thought playing in the Edinburgh derby was great. Being Scottish and being brought up here, I’ve watched many a Hearts-Hibs game on TV. I was well aware of the rivalry and passion between both teams. To actually play in it in that atmosphere was tremendous. I’m really looking forward to tonight. “This is why I came to Hearts. I had some options but, being Scottish, I know how big Hearts are. The rivalry with Hibs, Celtic, Aberdeen, Rangers and teams like that is great. Last time I was in Scotland, I was with Inverness and Ross County. Let’s be honest, it’s a lot more mellow playing for those clubs. 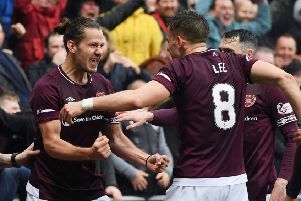 I’ll always be indebted to those two clubs because they were great for me but there isn’t quite the intensity or pressure of being at a club like Hearts. Being thrown into these kind of games is the reason I was delighted to come here. He faced world-renowned superstars like Sergio Aguero, Wayne Rooney and Mesut Ozil whilst with Cardiff City. Being propelled into a debut as a substitute against Hibs after just ten minutes caught him off guard slightly, though. “I was just sitting on the bench having a chat with one of the young boys, just getting to know him really. Then, the next minute, I’m going on,” smiled Cowie, who had played just seven times for Wigan this season. Experiences south of the border and with Scotland will stand him in good stead over time. Hearts see him as a key competitor in midfield as well as an influential figure around Riccarton. That he already knows plenty about Scotland’s top flight is a bonus as the Edinburgh club strive to qualify for Europe and reach the latter stages of the Scottish Cup. He went on to Cardiff and Wigan before being lured north by the pull of Hearts. “The whole package just seemed perfect for me. Hearts are a massive club in this country. I was thinking that, if Rangers and Hibs can both come up from the Championship, it’s got the makings of a tremendous league. We are progressing really well and Aberdeen are starting to challenge Celtic. Potentially, there’s getting into Europe. Potentially, there’s winning a cup. Hearts just seemed right for me.